BARE Balance bars are sweetened with all natural organic agave and brown rice syrup. They contain 15 grams of protein, up to 5 grams of fiber and up to 7 grams of whole grains. The bars have 200 calories, 19 vitamins and minerals, and are an excellent source of antioxidants. Each 1.76 oz. single serve BARE bar adheres to Balance Bar’s proven healthy 40/30/30 nutritional model (40% of calories come from healthy carbohydrates, 30% from quality protein, and 30% from dietary fat) to help stabilize blood sugar levels, satisfy hunger and provide lasting energy. Balance Bar BARE is certified Kosher, and nutritional information and tips can be found on www.Balance.com. Let me start right off by saying WOWZA! I was blown away by how tasty these bars were, shocked in fact. They are all outstanding. 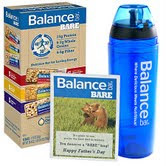 I had just recently reviewed Balance Nimble bars and they were not so great to me but THESE, now these are WAY too good to share with my husband...but I will...just this once...and only because Father's Day is coming up and well, Balance Bar asked me to hehe. Seriously, these are a must try! My husband took a few to work and said he has never had a bar that was so delicious before, that was healthy. ·15 BARE Balance bars in three delicious flavors – Sweet & Salty Peanut Butter; Sweet & Salty Chocolate Almond; and Blueberry Acai. Guess what? Right now, this very second on Mama Nibbles you can have the chance to win that whole set. You can share it with your Dad or a loved man in your life -plus- you can sneak one into your purse when nobody is looking LOL. I don't judge! So enter below, and maybe WIN! US only, must be 18+, giveaway ends 5/25 @ 12:01 am EST.